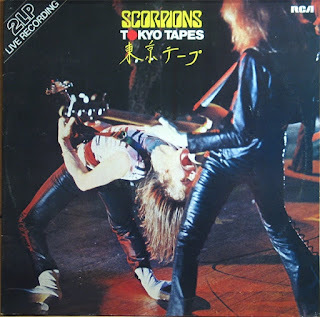 "Tokyo Tapes" is the first live album by "Scorpions" and their final album released by RCA Records. The album recorded live in Nakano Sun Plaza, Tokyo, Japan, April 24 & 27, 1978, and released at the same year first to Japan then to Europe and in 1979 in US. "Tokyo Tapes" includes songs from all Scorpions' albums released before 1978. It was the right time to put out a live recording to represent the end of an era, and satisfy the fans who had been demanding an official concert release for long. Japan was the chosen place, where the German metallers had always been acclaimed and admired. Since Deep Purple’s “Made In Japan”, the Asian country had become a special location to perform rock shows, some had some kind of fetish with it. So, the band was ready to introduce in front of a huge devoted Japanese crowd the “Taken By Force” album new tracks and also perform some of the previous classics, a bunch of them. The gig starts pretty intense, with casual melodic tracks like “Backstage Queen” or “Pictured Life”. “He’s A Woman - She’s A Man”, “Dark Lady” or “Speedy’s Coming” are absolutely brutal, pure aggression and speed, on which Rudolf and Uli’s fierce riffing becomes so damn harsh, relentless, like nobody else did by that time. Each of these compositions becomes certainly superior, much more passionate, loose, violent and solid than anything "Scorpions" did before. hese shows were guitarist Uli Jon Roth's last performances with the band, who had announced his departure after the release of the studio album "Taken By Force". Ulrich Roth - Lead Guitar, Backing Vocals, Lead Vocals on "Polar Nights", "Fly to the Rainbow" and "Dark Lady"
Rudolf Schenker - Rhythm Guitar, Backing Vocals, Lead Guitar intro on "He's a Woman - She's a Man", Lead Guitar on "Steamrock Fever" and "Long Tall Sally"
The best live one I have in my collection! Really is a good live record. And your blog is very well. I added it to mine.